Brian here, occasional guest blogger for team mermaids. 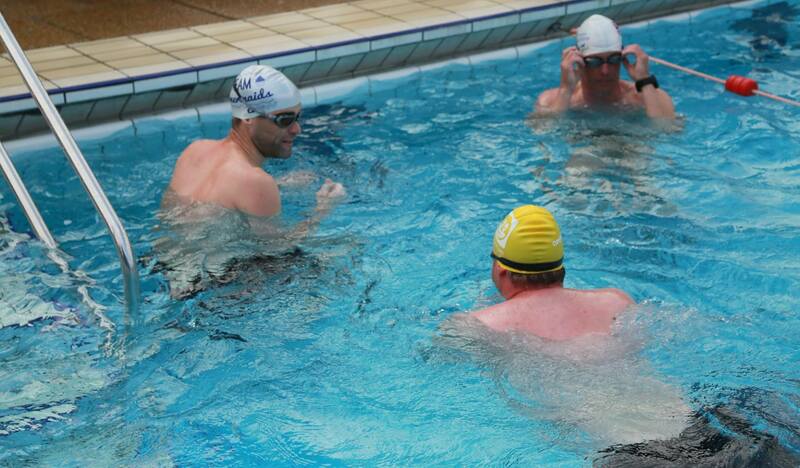 On the 22nd April I took part in the 2swim4life event in Guildford Lido for the second time. 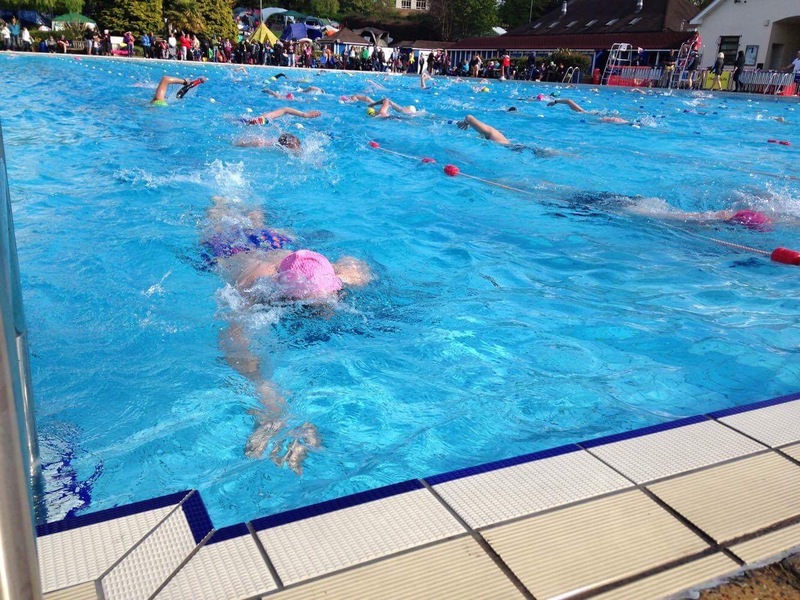 The format of the event is that you swim a mile every hour for 24 hours. I was aiming for about 26 minutes per mile, which would mean I had just over half an hour to rest, recover, refuel, etc. The swim started at 9am on Saturday morning, going overnight until 9am on Sunday morning. Having done the event in 2015, I knew it was a good idea to stay in Guildford on the night before the swim, so I had booked to stay in the Premier Inn across the road. I was due to swim in lane 3, and had made contact with some of the other swimmers in my lane before the event. We met in the lido while assembling our tents, and then went for dinner in the premier inn to talk about the swim, and all things swimming. Most of the other people in my lane had swum in 2swim4life before (either as a relay or as a solo), so there was a lot of experience in the lane, and we agreed to share the workload in the lane, and to rotate the lead so that everybody got a chance to draft. I was very lucky to have lots of experienced crew to support me during the swim. Dan, Allison, Lisa, Katie and Charlie all helped, mostly making sure that I was getting through the rest periods OK, and eating enough food. Although half an hour sounds like a long time, it was a real struggle to get everything done before I needed to get back to the pool. I quickly settled into a routine where I would get changed into my next swimming togs straight away, put on as many layers as possible, and have something to eat and drink. That would usually take me until about a quarter to the hour, which meant I had about 5 minutes to relax, before heading down to the pool area about 10 minutes before the next swim. Having started in lane 3, I quickly started to get too cold. 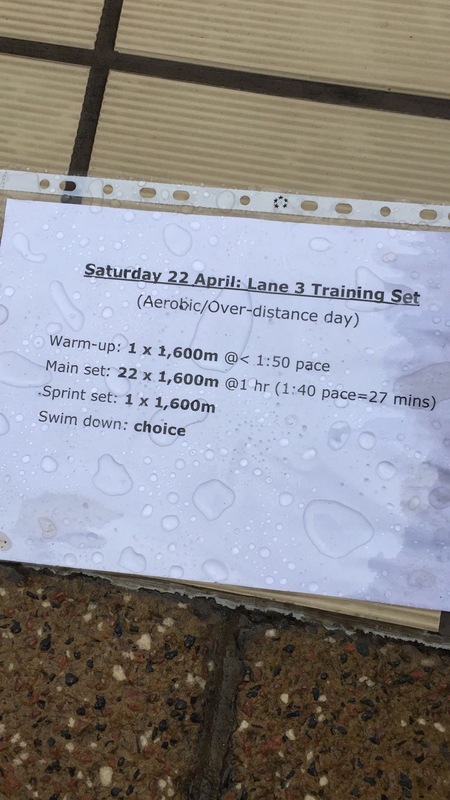 The advantage of drafting off other swimmers is that you don’t need to work too hard, however given that there were 8 or us, I was only at the front of the lane for 200m each mile, and was getting cold as I was not working hard enough. The water temperature was about 20 degrees, so it was easy to get chilly when you stopped working. I think Dan and Allison were getting very worried about how I would finish the event if I was already shivering after only 2 miles. I remember hiding out in the tent between the swims (the sunshine almost made the tent into a greenhouse, so it was nice and warm). Dan and Allison had been checking the other lanes, and after three swims we decided that I should move up to lane one. This lane had a mix of solos and relays, but crucially allowed me to swim a bit faster and keep warm. 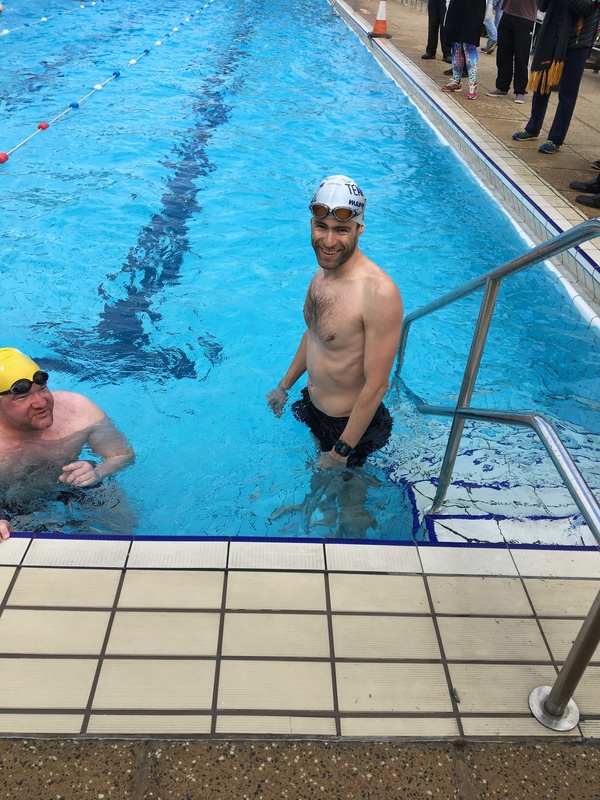 I settled into a routine of swimming with another soloist (David) and an Otter swimmer every second mile (he was in a two person relay). 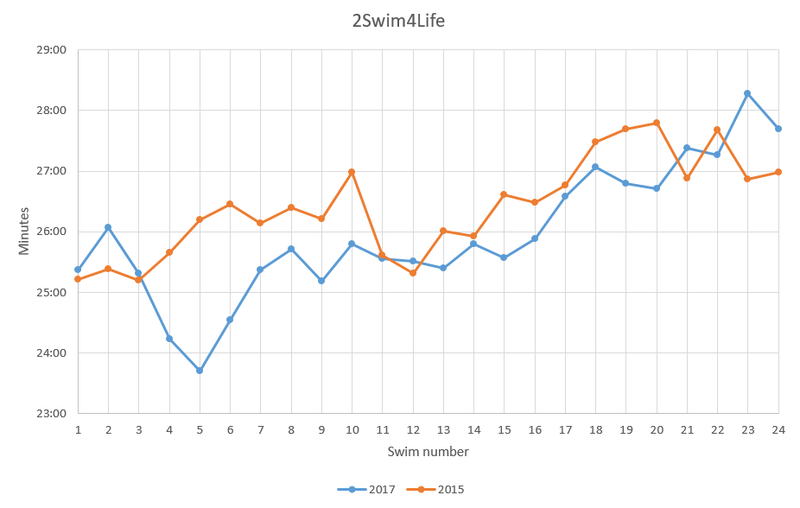 I was still only swimming at the front every 200m, but it allowed me to swim faster on average. Part way through the day, I realised I was short of towels, so put in an emergency request to Lisa and Katie to bring some spares with them. In an ideal world, I would have had 24 togs and 24 towels so that I would never have needed to put on wet togs or dry myself with a wet towel. In the end I think I had about 11 pairs of togs (about half of which I managed to dry during the day), so I was putting on wet togs for the last 8 or so swims. I’m not sure what I was thinking when I brought so few towels — maybe I had forgotten how miserable it is to dry yourself with a cold/wet towel. 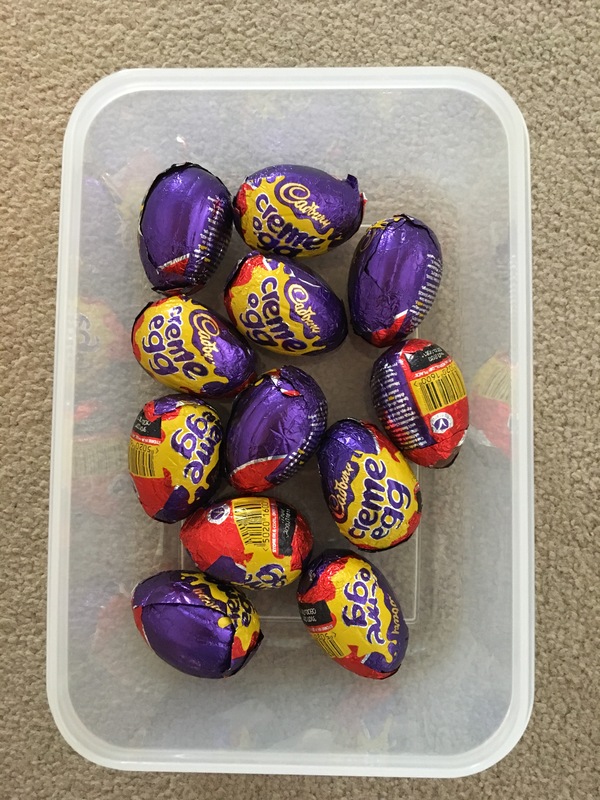 In terms of food, I had a massive plastic box filled with all sorts of goodies. As it turns out, I had brought too much, so some of it was either “donated” to the lifeguards at the end of the event, or brought home with me. I think the food I enjoyed the most was: cold pasta, bagels, noodles, hot ribena, chocolates, and biscuits. I would definitely try to bring less food if I had to do it again. 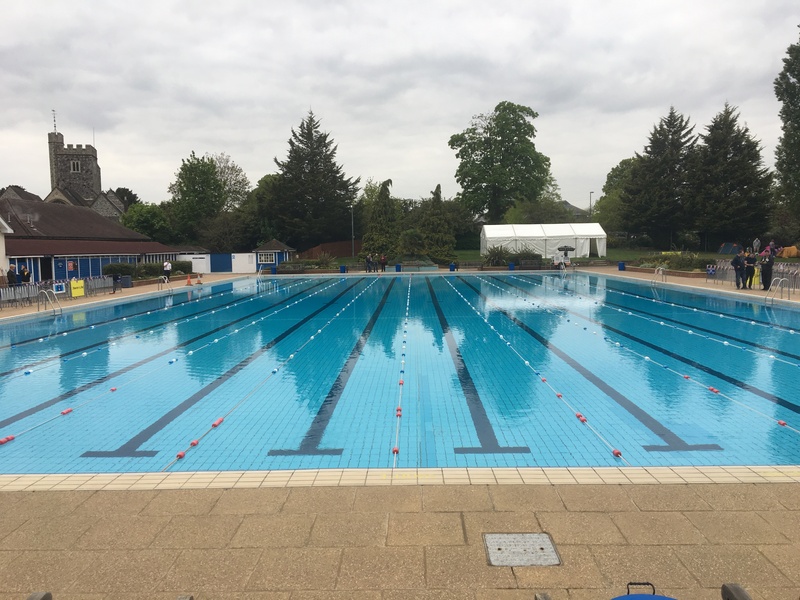 I thought I would be able to relax at the end of the 24 miles, but the journey home turned out to be just as grueling as the swim… It was London Marathon weekend, so I was not able to drive home like I had done after the previous swim. Instead, Charlie and I got a taxi to Ealing Broadway (the end of the central line), and took the tube all the way to Bank, before changing for the DLR. 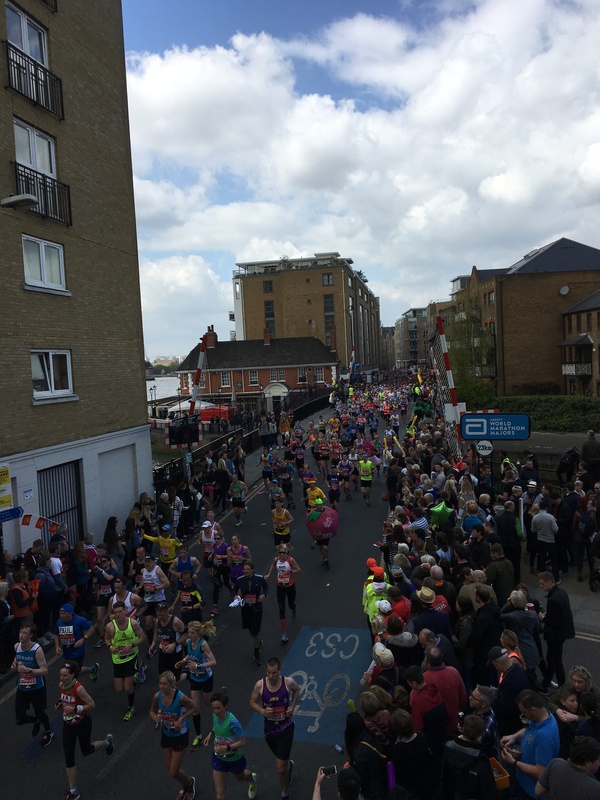 Then I had to negotiate through the London Marathon crowds with a big heavy plastic box (luckily it had wheels), and a duffelbag full of my swimming kit/tent/chairs etc. All in all, I am glad I did the swim. It had its tough points, but there was a really good camaraderie, even if the “chat” in the lane became more and more brief as we all got more and more tired. I think I’ll give it a miss in 2019, but if one of my valiant crew decides they want to swim it, I’ll be first in line to return the favour and crew for them.